In spite of being plenty old enough to know better, I've been skipping breakfast for years. So, with the onset of the cold weather, I decided on a new regime. Just as I was plucking Harraways Rolled Oats from the supermarket shelf a few days ago, I bumped into A. Who, after the greetings, told me exactly how to make my breakfast porridge in the microwave. By morning two, I was really looking forward to the result. Morning three and I was running late for a non-negotiable meeting time. I scuttled through the shower, threw on the sandy-coloured Topshop dress I bought from Karen Walker's Wellington shop, and topped it off with a long necklace comprised of three bronzey chains (the sort of bling you can pick up in Buenos Aires for a song). I prepared my porridge as per A's excellent instructions, carried it steaming to the table and sat down. Unfortunately, a whiplash effect ensued - I stopped moving forward but the chains did not. By the time my bottom hit the chair, the three long strands - now loaded with hot cereal - swung back to follow me. The result was a liberal coating of porridge down the front of the dress, not to mention my arms, the table and some of the floor. Moral of the story? 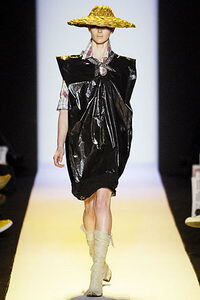 If you dress before you eat, dine in an inverted rubbish bag for your protection. And look ... it's an idea that's already hit the catwalks. The hat is presumably designed to fend off overhead attacks by other people's porridge. Very droll, Jane, very droll!